The blogosphere is the most explosive social network you’ll never see. Recent studies suggest that nearly 60 million blogs exist online, and about 175,000 more crop up daily (that’s about 2 every second). Even though the vast majority of blogs are either abandoned or isolated, many bloggers like to link to other Web sites. These links allow analysts to track trends in blogs and identify the most popular topics of data exchange. 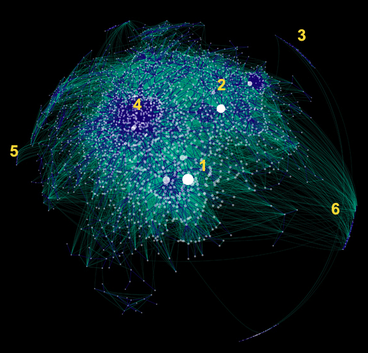 Social media expert Matthew Hurst recently collected link data for six weeks and produced this plot of the most active and interconnected parts of the blogosphere.